Geronimo struts like a macho should! A true golden medium fawn in colour, he has an attractive natural upright carriage, with a soft handling crimpy fleece. 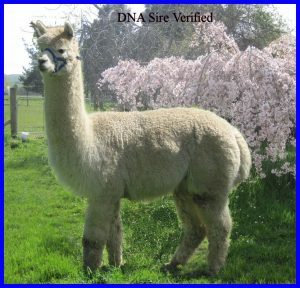 His sire brings the iconic Purrumbete Inti and Purrumbete El Dorado into his pedigree which features other well known studs such as Cedar House Brave Heart and Somerset Peruvian Challenge. His dam, Angel, still had a 25 micron fleece at 12 years old, and it still feels great. With heritage like this, Geronimo has potential plus! Shearing on 11-Nov-2016 produced 4.48 kgs (5th fleece). Sample statistics: Mean=26.7, CV=16.9%, SD=4.5, SF=25.2, CF=82.4%. Shearing on 13-Nov-2014 produced 4.48 kgs (3rd fleece). Sample statistics: Mean=24.82, CV=15.3%, SD=3.80, SF=23.11, CF=94.3%. Shearing on 24-Nov-2013 produced 3.09 kgs (2nd fleece).Sample statistics: Mean=21.60, CV=17.2%, SD=3.70, SF=20.39, CF=98.1%. Shearing on 10-Nov-2012 produced 1.73 kgs (1st fleece- 8 months growth).Sample statistics: Mean=18.36, CV=20.6%, SD=378.00, SF=17.81, CF=99.6%.